Backed by rich industry experience and knowledge, we are involved in bringing forth for our clients a wide array of PVC (Polyvinyl Chloride) Printed Boxes. The major objective of our organization is to provide immaculate quality of these boxes to our valuable clients. Our unwavering focus towards maintaining consistent quality in our offered products sets us apart from our competitors in the industry. 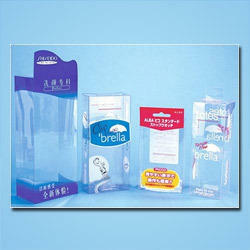 Our major objective is to provide the immaculate quality of PVC (Polyvinyl Chloride) Printed Boxes. These are widely praised in the industry for their distinguish features. These are ingeniously fabricated by utmost care and has an ability to fulfill the demands of our patrons. These are designed in such a way, that they provide the full safety and care of the goods kept inside them.